Whether you cook everything from scratch or not, sometimes your old standbys need a little pick-me-up. 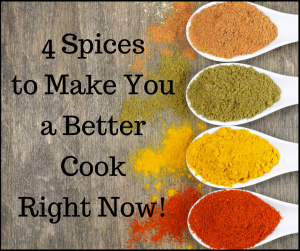 Here are four spices I use regularly to take a meal from good to WOW! with just a few shakes of the jar. The first thing that comes to mind when I say paprika is…deviled eggs. Well, I am here to tell ya, it’s so much more than a color splash for your picnic. It’s a flavor splash! But don’t confuse paprika with chili powder or chile powder. 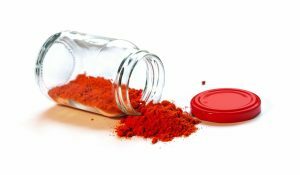 Paprika is an ingredient in chili powder. Chile powder is ground up cayenne, chipotle, or ancho peppers. Not bad, but very different from chili powder and paprika in flavor and heat. If chili powder has paprika in it, why not use that? Well, you can. But if you’re like me, you like a bit more control of the flavors in your dish. Chili powder–paprika, oregano, garlic powder, cumin, and sometimes cayenne–is great, but sometimes I just want the pure earthy spice paprika gives. To get the most out of it, quickly dry toast it on low in a cast iron pan, remove from heat, add oil (or lard), and stir. Overcooked it becomes bitter. The smell is wonderful and reminds me of my grandmother’s cooking. She toasted and oiled her spices before using them. Ideally, grow your own paprika peppers, roast or smoke, dry, and grind. I don’t have the words to describe the taste, much less the smell of this. BUT I am sure, like me, you rarely have that kind of ideal, so buying the best paprika you can is totally worth it. 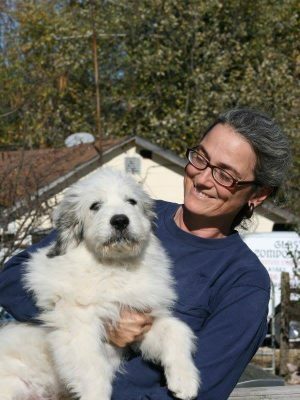 Each variety–smoked, Hungarian, and Spanish–have a different flavor, so try them all. So how do you use paprika? In everything! Stews. Roasted pork or chicken. Meatloaf. Eggs. Casseroles. Chili. BBQ sauce. Marinades. Brownies. And yes, on those deviled eggs. How many ways can I say I love cumin? It’s the spice that overwhelms me with memories when I use it. As I said, my grandmother toasted spices before using them and cumin was used a lot. Cumin has an earthy, nutty, slightly spicy flavor. If you want to give your dish a Mexican, Indian, or Middle Eastern flare, add a dash of ground cumin. How to use cumin? By far my favorite use is in sautéed squash. Yellow squash, zucchini, any summer squash is fine. Thinly slice the squash along with onions and add it to the toasted and oiled cumin, salt and pepper to taste, cook until just tender. For a medium-sized squash, start with 1/4 teaspoon of cumin. I add it to beans, rice/quinoa, taco meat, soups, sautéed veggies, chili, meat rubs. Once you know the flavor, you will start adding it to lots of things. Cumin Shortbread? YES! This one is a recent discovery for me. I don’t remember what I was cooking, but it called for dry mustard, so I reluctantly bought some thinking it would last my lifetime for sure. Now, I go through a jar every few months. Dry mustard has a nutty somewhat spicy flavor. It can give a dish a bit of a kick that isn’t long lasting. Something about it seems to bring out the flavor. I add dry mustard to any Asian inspired dish, sauces, stews, egg salad, roasts, chili, burgers, salad dressings, and mac & cheese. If you aren’t a fan of vinegary mustards, add dry mustard to your mayo for the “kick”. Oh, the spice we’ve relegated to Christmas use only! Such a shame! Yes, nutmeg is wonderful in all the holiday treats, but it’s so much more than eggnog topping. Nutmeg is the chameleon of spices. Sweet, savory, hearty, light. Nutmeg bends to and enhances the ingredients. Bland soup–add nutmeg. Pork burgers missing something–add nutmeg. Baked goodies need a pop–add nutmeg. Tired of boring coffee–you know what to do. But nutmeg that’s been sitting in your cabinet for years–don’t use that. Don’t even buy the highest quality ground nutmeg you can find. You want whole nutmeg. 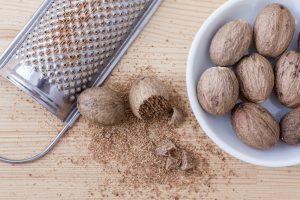 Nutmeg is a seed that should be freshly grated to really get the most out of it. That does mean you’ll need to dish out about $10 for a decent Microplane, but it’s worth it once you taste freshly grated nutmeg! And a jar of whole nutmeg will stay fresh and potent for years, unlike the ground stuff. A little nutmeg goes a long way, so use it sparingly until you figure out your taste preference. Then go nuts! Fruit salad. Pork burgers. Stews. Roasted meats. Soups. Pasta. Sweet potatoes. Egg and milk based dishes like custards, béchamel, and cheese sauces. And of course, sweets! When I was drinking coffee I started adding a dash of ground cardamom to it. I read it helps to reduce the acidity of the coffee, making it easier on your digestive system. That’s all well and good, but I just like how it tastes! It has a bit of a sweet, floral, yet spicy flavor. Like nutmeg, it can be used in sweet or savory dishes imparting a warmness to the dish. Use it sparingly to start; too much cardamom will ruin a dish or cup of coffee. Not a spice? Think again! 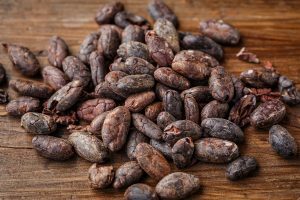 Cocoa powder is made from the seed (bean) of the cacao tree pods. 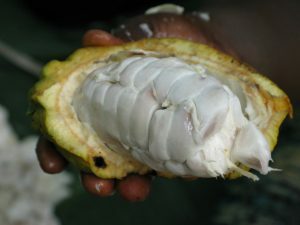 Fun Fact: the flesh covering the seed has a lemon flavor. I tried it when I was in the South Pacific. So while it’s delicious in your cake, it’s just as good in your chili, BBQ sauce, and meat rubs. My pot of chili always gets a tablespoon of cocoa powder. The Aztecs/Mayans/Mexicans regularly combined cocoa with peppers in their cooking. Mexican Hot chocolate anyone? How about some Molé? What’s your favorite go-to spice that makes a meal a masterpiece?